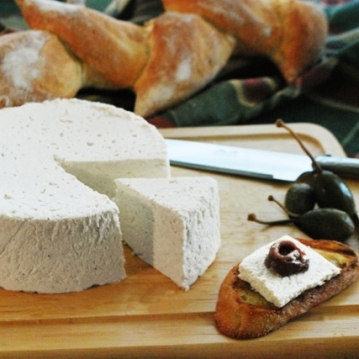 This recipe of "Queso Blanco" is delicious and pure, without preservatives. You can add some roasted red peppers ( jalapenos), sun dried tomatoes or some aromatic herbs. You’ll love it. 1. In a nonstick saucepan heat the milk at medium heat, stirring constantly. 2. When the milk is boiling, take the saucepan out of the heat, add the cider vinegar and the salt, stirring constantly. 3. Cook to medium heat for about 3 minutes. Remove from the heat when the milk had solidified into a curd. 4. Line the colander with the cheesecloth and fix it with the clips. Keep the colander over a bowl. 5. Drain the curd. Reserve 1/2 cup of whey. Let them cool in the refrigerator. 6. Tie the four ends of the cheesecloth and squeeze the curd. 7. Place the squeezed curd in the saucepan at medium heat, add the whey, then the heavy cream little by little, stirring constantly. Cook for about 8 minutes, pressing the solids until they are homogenized. Check the salt. 8. Transfer to a round storage container of 7x3 inches. Cover and refrigerate over night. To see step by step pictures visit www.chefmariaamado.com in "Abrebocas y Entrantes"